Attention: Due to the upcoming holiday on Sunday, April 21, the ProShop will be closed. Free parking is available during non-event times in the North Station Garage located directly below TD Garden. To obtain free parking, you must make a purchase at the ProShop and request a chaser ticket at checkout. Take a look below at what's new. The all-new ProShop will be much more spacious and provide an improved shopping experience for fans. At more than 6,000 square feet, the new ProShop is more than double the size of the old store. 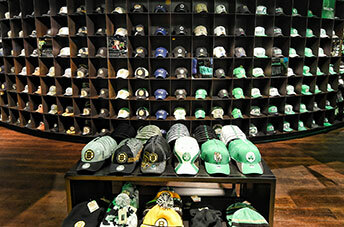 The Hat Wall at the ProShop is the focal point of the store, showcasing nearly 300 styles of hats. 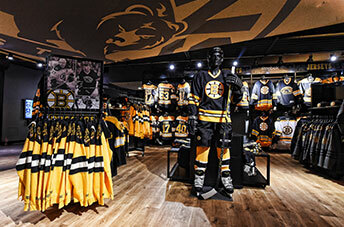 The new ProShop boasts state-of-the-art video technology and graphics, has two fitting rooms, more than double the amount of registers in one centralized checkout location, and offers a jersey customization kiosk. 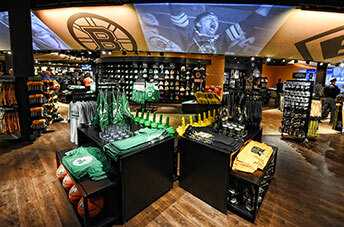 Sign up for the Boston ProShop Newsletter, your official source for authentic team merchandise, customized apparel, exclusive Garden items, and much more. By signing up, you’ll receive special offers and information on upcoming retail events.